Don't Buy Stuff You Cannot Afford! Mmmm, a Date! !...What is a Date??? You Go, Bubba!! He's even got his eyes closed!! A double-take! Okay, maybe you don't think so, but in real person, this little boy we met at Chuckie-Cheeses named Blake looked exactly like our Alex! My beautiful niece, McKaylee, proving that you cannot eat 6 Saltine Crackers in a row in under a minute without drinking water....try it!...it's impossible! 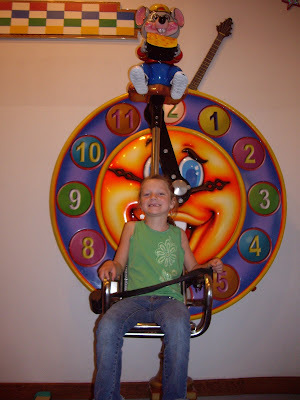 Hickory, Dickory, Dock!..Brinley went up the clock!...and down and up and down and up! Your girl has the moves! That is such a cute picture! Hey Kristin! I am glad you found me thru the blogging world! I just spent some time reading up on what's been going on with you! Thanks for your comment on my blog, it made me laugh. I actually know ashley thru the blogging thing too. She is friends with my sister in law, sarah. Small world! I will keep checking in to see what you are up to! Thanks for finding me! what?? Charly is going for the "BIG" bubba?? So cute! I didn't notice you in our jumping picture! However when you brought it to my attention I couldn't stop laughing! Whoah- that kiss is majorly passionate. As my daughter would say, that's a "married kiss." Hehe. Yes- like Mel said, I know her through blogging, and she is my friend's sister in law. Hehe. She definitely cracks me up. Charly is SO adorable. You make good babies. Oh my crud..that kiss is hilarious! You HAVE to keep that on hand for when they are older. They will die!!!! And MAN..that little kid DOES look just like Bubba. WOW! Wasn't it in idea where we so ANOTHER little kid that looked like Bubba? Crazy. Wow! That is hilarious! How funny. I love it when Brady goes to kiss me and grabs my neck like he's gonna choke me...haha. So cute. Andy holy cow! That little boy looks exactly like Bubba. 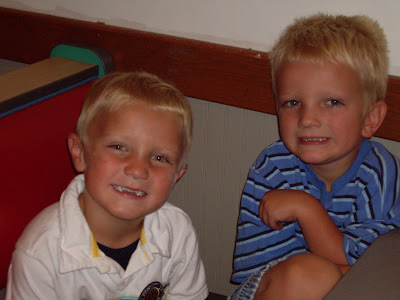 Especially if Bubba had his hair spiked up like the other boy. How funny. Thanks so much for watching the kids for our little get away! They had a blast! Love you! Me again. 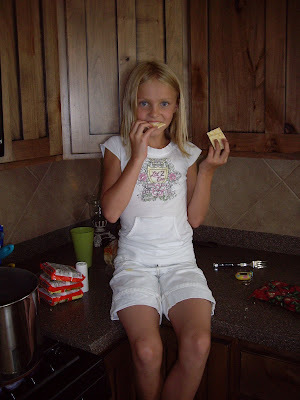 So I just looked at Jenna's blog and it looks like your little angel is playing the field. She was planting her lips on cute little Austin. CHARLY!!! Bubba will be devistated! I'll break it to him lightly!